Originally published on www.hipmunk.com/tailwind, October 25, 2015. 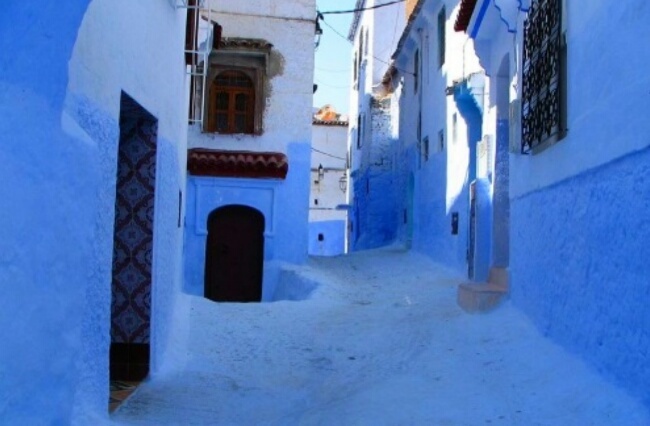 Film buffs wanting to immerse themselves in the sets and landscapes of their favorite films will face a welcome dilemma in Morocco: where to head to first! 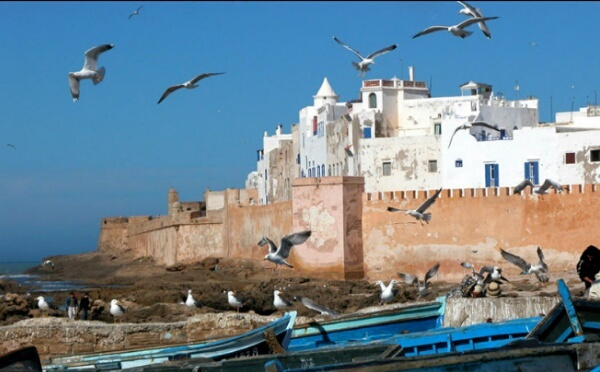 The North African country has played host to some of Hollywood’s most iconic blockbusters including the Elizabeth Taylor extravaganza Cleopatra, Lawrence of Arabia, and modern pictures such as Gladiator, Kingdom of Heaven, Inception, and Mission Impossible: Rogue Nation. The incredible diversity of the country continues to offer producers everything from the rippling sands of the Sahara Desert to lush green oases, ancient mountain kasbahs, and stunning coastal stretches. Known as “the door to the desert,” the largest town in Saharan Morocco is 120 miles from Marrakech and has one of the country’s biggest draws for movie enthusiasts: Atlas Studios. The largest film studio in the world by landmass, Atlas Studios has enormous full-scale sets. You need only walk several metres to pass from the Tibetan Monastery of Martin Scorsese’s 1997 film, Kundun, to the Roman marketplace where Russell Crowe’s character, Maximus, got sold into slavery in Gladiator. Set pieces and props from many other films such as Asterix & Obelix: Mission Cleopatra, Lawrence of Arabia, Cleopatra, James Bond: The Living Daylights, The Mummy, Alexander, and Babel also remain and are sometimes re-used in other films or for TV. Most staggering of all is the huge set of Jerusalem from Ridley Scott’s Kingdom of Heaven, which looks impressively real in person. 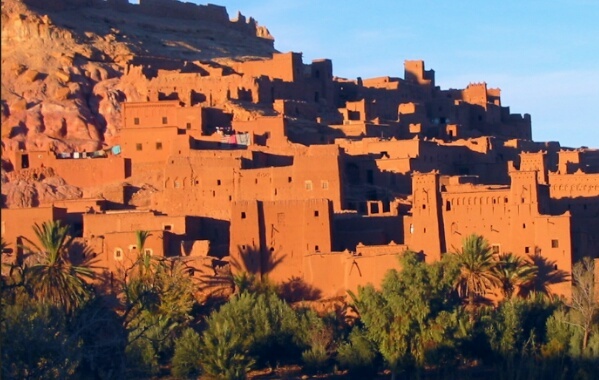 The fortified city, or Ksar, of Aït Benhaddou is a popular spot for filming. And it’s easy to see why, as you take in the rich red colour of this giant sandstone city, framed by mountain peaks and palm trees. 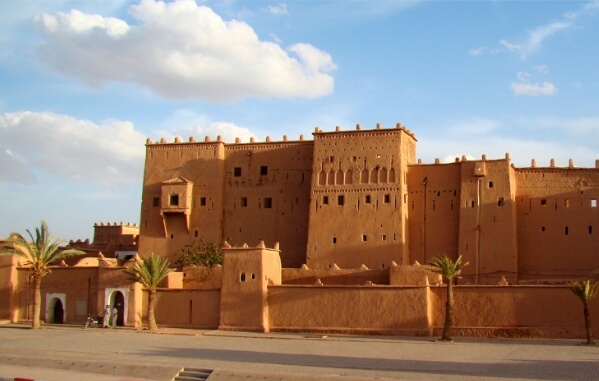 It’s the ultimate exotic desert city and has 700 years of history behind it. Sodom and Gomorrah, The Sheltering Sky, Jesus of Nazareth, Lawrence of Arabia, and Kundun were filmed here. It was also used in Gladiator as the principal location for Russell Crowe’s training and fighting scenes. 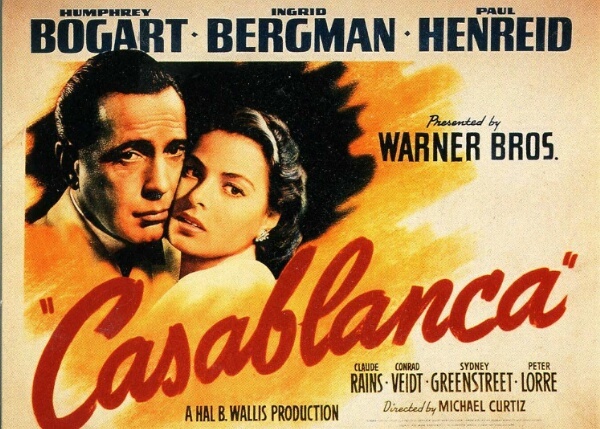 Even Humphrey Bogart was susceptible to the allure of Morocco’s eclectic mix of African and European influences present in Casablanca, but surprisingly enough, the 1942 film noir masterpiece was filmed entirely in Hollywood. That doesn’t stop fans wanting to bring a little style into their lives by sitting back in Rick’s Cafe. Although not an original set, the seaside situated cafe started by former American diplomat Kathy Kaiser in 2004, has masterfully captured the refined luxury of the classic film. Don’t miss the jazz nights, and for a full immersion, the film is played in one of the rooms on the 1st floor. Bear in mind there is a dress code — sneakers or flip flops won’t cut it. Alfred Hitchcock’s 1955 The Man Who Knew Too Much was set in Marrakech. 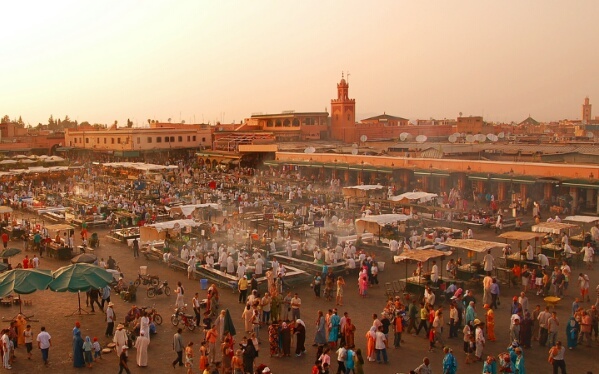 The opening scenes of the film were filmed in the souks of the main square, Djemaa el Fna. A UNESCO Heritage Culture Centre in the heart of the Marrakech, walking though Djemaa el Fna can be quite full on; there’s always a lot happening. During the day there are snake charmers with their undulating cobras, right next to water sellers in colourful costumes and brass cups. There are also magicians, acrobats, monkeys and hundreds of food stalls. The square has been a symbol of the city since the eleventh century, and sometimes, walking through it all really can feel like being taken back in time. Martin Scorsese has filmed two major motion pictures here, The Last Temptation of Christ in 1988 and Kundun in 1997. The luxury hotel La Mamounia was featured in The Man Who Knew Too Much and the surrounding gardens were also used in Oliver Stone’s Alexander. Based on the Shakespearean play, Orson Welles’ Othello was partly shot in Essaouira in 1949. The production didn’t go to plan at first, as Welles’ European financier went bust just months into filming. Yet using his own money, Welles was finally able to complete his vision, submitting his film to the 1952 Cannes Film Festival under the Moroccan flag, where it won the prestigious Palme d’Or. His vision encapsulated historic landmarks of Essaouira, that remain unchanged today, like la Skala de la Ville, a former artillery post. Rising up over the town, it’s a vantage point that gives a stunning view of the surrounding waters. Essaouira is a popular seaside town, just over 100 miles west of Marrakech, which many Moroccans go to in summer to escape the heat of Marrakech and Rabat.